Klotzbach and Gray: "the next two weeks should be active" | Watts Up With That? 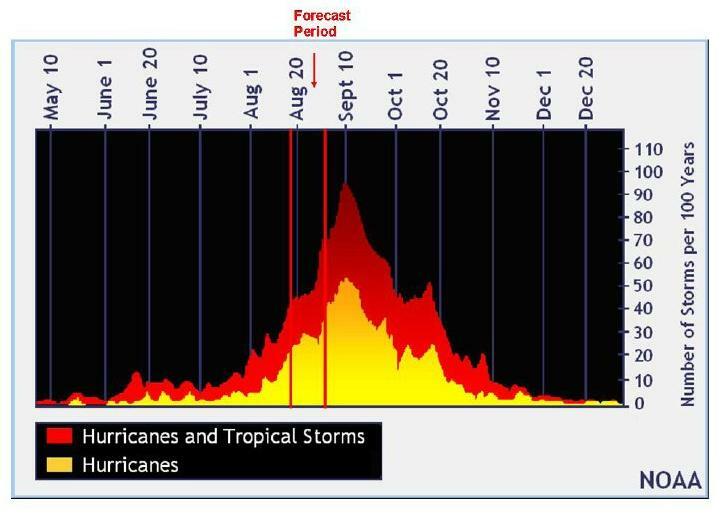 Klotzbach and Gray: "the next two weeks should be active"
The CSU Klotzbach/Gray Aug 18-31 hurricane forecast is out. Based on the NOAA historical tropical storm and hurricane frequency below, they are betting on an uptick in activity. We expect that the next two weeks will be characterized by heightened amounts (130 percent or more) of activity relative to climatology. The above-average forecast is due to a combination of factors. The primary factor is that most of the global models are very enthusiastic about TC development over the next few days. Most of the models indicate that the wave currently moving off of the west coast of Africa will develop into a classic Cape Verde-type hurricane in the next few days. These systems typically propagate across the tropical Atlantic and generate large amounts of ACE in the process. Most of the models indicate that the system should be entering an environment favorable for storm intensification, and therefore, the likelihood of this system having a long lifespan across the basin looks good. Models also indicate that TC development in the western Caribbean as well as additional development in the tropical Atlantic also is possible over the next week or so. We do not expect the MJO to play much of a role in modulating storm activity, and since we overall have very favorable climate conditions for an active season, we believe that the next two weeks should be active. The two-week forecast of tropical cyclone activity from August 4 – August 17 did not verify well. Activity at above-average levels was predicted, while observed activity was at below-average levels. The primary reasons why we believe activity was reduced during the two-week period were due to dry mid levels in the atmosphere and increased vertical stability This dryness was not expected. Also, several upper-level cold lows intruded into the tropics during the period, imparting upper-level westerly shear and hindering storm formation. However, it is not unusual for the first half of August to be almost tropical cyclone-free. The only ACE generated during the period was by the remnants of Tropical Storm Colin that regenerated on August 5 but was then torn apart by shearing from an upper-level low on August 8. Our forecast was for an above-average ACE value of 10 or more units (>130% of climatology), while a below-average ACE of 2 units (22%) occurred. The Madden-Julian Oscillation was of a fairly weak magnitude throughout the period and likely did not play much of a role in modulating TC activity. only 22% must be tough to see. August 17, 2010 in Forecasting, hurricanes. Divergences can make for great learning opportunities. I have a hunch that this pair won’t disappoint. That one disappeared before it even started developing. Yes, sooner or later we will have tropical development, and sooner or later the ice will start to diminish in the Antarctic, and trend downwards from a record level. Our climate scientists are brilliant. It should be kept in mind that this forecast, and the previous (fail) forecast are only weather forecasts, though from the sound of it, based on climate models. It should also be pointed out that a hurricane is weather, a hurricane season is climate. There have been two failed season predictions in the last two years. Will this be number 3? As the graphic shows, the next 4 to 6 weeks are the peak time. Time will tell and that time is here. For those who don’t already have it marked, this site shows the active depressions, storms and hurricanes. For their sake I hope they’re right. Maybe we’ll also be spared the sight of weather forecasters reporting in breathless excitement on the remnants of a tropical depression reforming into a tropical depression. We’ll see how the next six weeks unfold and hopefully the forecasters can avoid getting all excited about possible tropical depressions or prematurely naming them before they turn into tropical storms. Klotzbach and Gray have the balls to admit they were in error and not make foolish excuses. I would agree with their analysis. However, my Ouija Board says 75%, I don’t see the mid latitude dryness abating any time soon. Take that for what it is worth. Then what do us geologists know anyway. I predict a humdinger of a Hurricane within three days either side of September 10th. I also predict a three-day period of well above average ACE (whatever that is :^) between now and September 15th (>140%). If I am correct, I will point to my published predictions and crow about it. If not, well, correct predictions are tough to make, especially about the future. Back on the 15th. I climbed out on a big limb, with chainsaw in tow, with this forecast? These guys are praying to the climatology gods for a storm! This is climate science in sharp relief is it not? Make a prediction, when the prediction does not align itself with reality then produce many excuses as to why the prediction failed leaving out the real reasons why the predictions failed. A failed climate state prediction does not fail because of a complex interaction of weather anomalies, it fails because the prediction was flawed because the prediction was based on flawed logic and reasoning. This is the crux of the problem, until the climate science community faces up to the fact that basing predictions on flawed ideology and flawed data then they will always produce failed models and predictions. I think I’ll agree with the forecast increased likelihood, but I’m basing this on neither models nor an historical graph showing an that increased likelihood should be becoming increasingly likely. The north-south split off the east coast of the weather streaming across the US is coming to an end. The flushing of the G&C by the south split and it’s shielding of the G&C from easterly weather is going to be gone. This is going to allow the Cape Verde stream to shift north. But it’s always been the case that things will likely ramp up, ’cause anything more than nothing has to be something. The two-week forecast of tropical cyclone activity from August 4 – August 17 did not verify well. Activity at above-average levels was predicted, while observed activity was at below-average levels. The above-average forecast is due to a combination of factors. The first statement seems to indicate that they haven’t a clue as to which factors to take into account. What happens when insurance companies, emergency service organisations and the like accept their ‘forecasts’ and expend money and resources ‘just in case’ they are correct? Will the doom-meisters accept responsibility for a waste of resources/time/effort or will they fall back on the ‘it’s better to be safe than sorry’ excuse for their scare-mongering? We expect that the next two weeks will be characterized by heightened amounts (130 percent or more) of activity relative to sedimentology. Does it make any sense or is it a poor translation? Hasn’t anyone got a trick knee they can consult? I’m going to bid a blind nil and call for no hurricanes cat 1 or above for the rest of the season. If I’m right, I might get a grant. I have a method. It is about 3,800 miles from Cape Verde to Miami. It takes a “Cape Verde Hurricane” about 10 days to make that trip. Currently none have started. ACE is calculated every six hours. As the hours slip by then for the forecast to be fulfilled more and more energy will have to accumulate in the waning days of the forecast period. Folks on the SE coast and Gulf coast may want to plan ahead and take a vacation in Idaho from Aug. 25th to Sep. 1. It is going to be an horrendous ride. Can’t go away. Stock up on beer and popcorn and watch the show! I believe they’re talking about the entire Atlantic ocean, which is a large area no doubt, but looking at their chart and number of storms/hurricanes per 100 years peaking at September 10, it works out to just under 1 a year – in the entire atlantic. This is HUGE!! Better keep a sharp eye out for that one storm or you might miss it..
Yep, my ACL replacement on my trick left knee tells me when it’s going to rain in Aberdeen, Scotland (which it’s telling me it’s not), but I don ‘t think there are any Cape Verde drivers for TS development from the North East of Scotland into the Atlantic/Caribbean. Sorry. One wonders if the models were “disappointed” with this prediction? Science must be entering a new state when scientists openly attribute human feelings to climate models. Is the relationship between man and machine becoming unhealthy? We know us non-scientists are often accused of having a suspect relationship with our cars or our table saws – but Scientists ? Could saying climate models are garbage be seen as a hate-crime? As my old grandmother used to say – “if you’re in love with a dung-heap, you won’t see a bad straw in it”. Maybe we’re in need of some sensitivity training. Let’s hear it for the models. The reality of predictions becoming reality, I think, are purely down to chance. There have been SO many dleiberately false predictions, or those which didn’t come to fruition for reasons not readily understood, I’m heartily sick of them. Even weather forecasts are unreliable beyond a few days, so how does anyone seriously believe they can predict anything other than the occurrences which happen regularly (like tides, phases of the moon, the sun rising in the morning, etc.) – everything else must be wrapped in chaos, and nobody REALLY understands whats happening, or has any real clue about what is likely to occur – it’s mostly conjecture and guesswork, the results of which are more often down to luck rather than judgement. It’s all driven by money and a desire to control. One thing that WON’T be controlled by man in his infinite stupidity, is the climate. Cold and warm periods recycle with relentless certainty – what isn’t certain is why or when, and those particular criteria are a long way from being understood, so basing predictions and alarmist portents of Armageddon on them is nonsensical. Ice comes and goes at the poles, and hedging your bets as to why, and what’s normal and what isn’t, and prognosticating in the dark without the true knowledge is daft. Science, alas, has degraded from the excitement and wonder of discovery, and the sharing and proving (or disproving) of information, to who gets what grant, how much, and whether or not it all fits in with the current political advocacy. If you keep predicting a bad hurricane eventually you’ll be right. I ran some numbers through my model last night and it tells me there won’t be much activity in the next two weeks. It’s a shame because I have to believe that at one time, when they first started out these “scientists” did so with awe and wonder at the natural world. They must have been driven by curiousity to endure the discipline of academia, and the beer-bongs. Sometimes I can see in my minds eye Mann in the role of Chris Farley on “Tommy Boy”, after graduation with his buddies where he falls and crushes the table after a lengthy, inverted bong hit. I still holdout and hope that one day soon some of them will stand up and ask themselves, “What have I become?”. I’ll continue to holdout for that day, but I won’t hold my breath. That would be consistent with my points about the current equatorward position of all the air circulation systems and especially the mid latitude jets. This is a good opportunity to see whether that scenario suppresses tropical storm activity. I don’t see any sign of a poleward shift yet especially since the polar highs are predicted to strengthen over the coming days. Thus my current bet would be on continuing lower than average tropical storm activity. development over the next two weeks at even odds. 2 to 1 odds against. Klotzbach and Gray make forecasts based on actual data. They sure beat the pants off the likes of Mann. Mother Nature can be very fickle, let’s see what she has up her sleeve before we laugh too hard at the Dynamic Duo. So far the only prediction that has been correct is Richard Holle’s. Earlier this year he stated that there would be little development of any tropical disturbances through the 20th of August. He is correct. (Read his detailed predictions on this thread). It remains to be seen if he is going to continue to be correct. But either way, and while many may disagree with his theories, at least he has the guts to be specific on things including the reasons for his predictions. 1. Warm Water drives ‘canes, so: a La Nina (cold Pacific-Equator) makes small storms heading up the East Coast. 3. El Nino (hot) – – starts near Peru & thus is right “under” the Caribbean. So it disturbs the storm-tracks — without a long buildup, the ‘canes are weak. 4. Unless it’s an El Nino MODOKI … these start in the West Pacific & that is a couple WIDTHS of the ATLANTIC away. >>> Thus 2007: extra heat, no disturbance. 5. Unless it is TOO strong — you get Saharan DUST “STORMS” which dull other Storms. Just look at the NOAA Global Aerosol Map — they extend all the way from Africa PAST CUBA. Now THAT is hurricane supression !!! >> PSS: Please note a rapid change can Mix Nino & Nina because the winds change fast, while Pacific Water is still creeping along at a tenth their speed … as: last Winter, when the El Nino warm Moist air charged into the La Nina East Coast Cold Pattern: Result: = Record East Coast SNOW. Doesn’t this choice of language strike one as a bit odd? Generally I’ve noticed there seems to be a perverse excitement amoungst the warmists for the actualization of their “doom and gloom” scenarios. They take delight and eagerly anticipate disasters. But why? Wouldn’t a “normal” person who predicts disasters hope that they are wrong? Sorry, I meant 2005, not 2007 (the Katrina/Rita/Wilma year). Still got Sea Ice on my brain — but there is a connection: Huge Smoke clouds from Russian Peat fires are slowing Arctic winds & cutting “Ice Export”. The three most important things are, results, results, results. Today’s global water vapor loop shows the dome in the South Atlantic still in place, albeit moving a bit west with some moisture entrenching from the North East. The dome in the North Atlantic is still ill defined on its southern portion but it does show enough spin to possibly affect a giant thunderstorm now coming off the coast of Africa – that one is not a “spinner” yet, but it does show some clockwise outflows. Although not much of it is there, dry air off the South coast of Western Sahara could again win that battle – we will know in 12-hours. Another big storm behind it at the same latitude has now started to dissipate and has taken more of a “wave” look. The track of these storms has now moved north of 10D N. This could indeed be the start of the Cape Verde Season. Moisture from the Indian Ocean is still entrenching into the East coast of Africa, albeit less than yesterday. In the pure fiction department, here’s a 300 hour forecast showing a longlived hurricane going extratropical as it heads for me in New England. Again, this is from the pure fiction department. It’s as likely that if we do get a hurricane then it will be from a different storm. The rest of the map is fiction too! Out of curiosity, what does Piers say about the next couple of weeks? I don’t know much about this, but what is going to change to create all this activity? The problem with the Cape Verde season is that the engine is limited. In the next 104 days, there will be about one wave every three days. Give or take. This is history speaking. The chance of any particular wave developing into a named storm is less that 1 in 5. Using this as a guide line, we will see about 5 or 6 CV storms in the time remaining. There are two categories of models; those that have been properly validated and those that have not. The output of validated models is almost as good as hard data. The output of non-validated models has very limited utility. The best use is in the development of new experiments. However, as predictive tools they are reasonably useless. One wonders whether, after the next two weeks, the models used by Klotzbach and Gray have not accurately predicted what happened, that these two gentlemen will admit that their models have not been validated, and are, therefore, just about the same as guessing. So, like a desperate gambler on a losing streak, they just doubled-down for the next forecast? After one big hurricane tracks through the region, SSTs will be close to normal along that path. Making it even more difficult for more to form. Uuuhhhmmmm – No other funding sources? Clearly, there are not nearly enough phytoplankton producing dimethylsulfoniopropionate. I guess the little buggers better hop to it, then! I am predicting hurricane activity at 70% of normal. predicted activity = 100 – (Klotzbach_Gray_prediction – 100). It has been working great the last 3 years! Everyone knows this is hard problem, and it will take time for results to improve. As long as nobody is grandstanding on the efficacy of the model results, then this is a useful academic exercise and I applaud them for being very open with negative results and discussions of what went wrong. This is what science really is. Compare this behavior with Henson’s climate predictions, he is so inwardly focused that bad results are correct, it gets in the way of progress. I wonder where in the world K&G get the data to feed into that model to get any sort of increase in their “ACE value”… The Cape Verde is cooling off faster than my coffee. I have noted that. The prognosticators seem to want to duplicate the 2005 season every year. I have yet to see a prediction of “normal to low” hurricanes since 2005 caught them by surprise. It seems to me that a key factor that is being ignored by hurricane forecasters is the solar cycle phase of the season being forecasted. The year after a solar minimum has significantly less hurricanes [average of only 3.6 hurricanes] the last one, 2009 had 3 hurricanes; the second year after a solar minimum [like 2010] is always slightly higher with an average of only 5.7 hurricanes. The 8-14 hurricanes being projected by many of the forecasters are very unlikely to materialize as the solar support is just not there yet regardless of what may happen the next two weeks. The global temperatures are up because of the El Nino not due to the solar activity. After the July 2008 solar minimum, the SIDC International Sunspot number is only 23, much slower in ramp up than cycle #23 and others. Hence the 2010 forecasts are going to be high again in my opinion as the solar support is just not there for such high hurricane season forecast. As much as I hope that we have yet another relatively quiet hurricane season , I can’t help but remember ’05 when tropical activity didn’t really get going until Sept. and lasted into Dec. . Hurricanes are tricky – they can defy even the best forecasts . There are so many candidates for Quote of the Week in Tim’s comment that I therefore nominate the whole thing. So, let’s see how busy and scary the hurricane nursery is. There are no active tropical cyclones anywhere on the globe today. A tropical wave moving westward through the central Caribbean Sea shows no signs of development. However, it will bring some locally heavy rainfall to Hispaniola, Jamaica and eastern Cuba today. Lighter showers from the wave could fall as far east as Puerto Rico and the Virgin Islands. So what we have at the moment is one newborn low pressure making a bit of noise. That’s it folks. The nursery is not afoul with screaming babies, no one is growing to adulthood in some freak of nature way, and in fact, the Atlantic nursery is awash in the sound of…wait for it…snoring. By pure chance they have to get a forecast right sometime, they have no skill they are just guessing, I can do that! Am I allowed to play the devils lawyer ? NOAA probably through intervention of its main administrator , appointed by mr. B.O. himself , has nearly manipulated all available data to prove that 2010 will be the hottest year ever as they have alreay forecasted on every possible opportunity this year ! Right ? Well , has all the SST data from satellites , i presume , gone totally untouched ? Then the burocrats have probably done only a partial job in manipulation of the data . Would rather the opposite be true that the burocrats were very loyal and probably too loyal? Right ? If the light of this hurricane season slowly fading with higher than usual temperatures nearly everywhere on the maps and the temperatures are the main drivers of hurricane intensity could there possibly be something very wrong with the basic temperatures of the SST – maps ? The proof of the pudding is in the eating and the proof of warming is in the hurricanes so the absence is showing ? What exactly ? Luckily there is a new army of knights, Anthony among them, reincarnated from above, who brandishing big swords, shaped like the awful and meaningful hermetic caduceus, and throwing out powerful and blazing Birkeland’s currents will spin the heads of those evil ones in a 270 degrees turn. If they can’t forsee events how can they predict the future? Anomalies don’t drive hurricane formation. If you look at the actual temperature loop there’s little or no cooling to see in the development region. See http://weather.unisys.com/archive/sst/sst_loop.gif The anomaly loop is useful to show there’s catching up to do. I don’t think K&G have increased their ACE prediction, they’ve maintained it at as a percentage of average. The prognosticators seem to want to duplicate the 2005 season every year. I have yet to see a prediction of “normal to low” hurricanes since 2005 caught them by surprise. So last year was forecasted to be less than average and in no season did they predict a repeat of 2005. The “normal to low” terminology, IIRC, is from NOAA’s forecasts. I don’t follow them closely, they don’t go into the same level of detail that K&G do, but they do a better job quantifying their uncertainty. Perhaps you can find the past NOAA forecasts and compare their recent seasons. Hmm, ok, I’ll give it a shot, with my skills developed looking at a large plot board of the WestPac and trying to devine if, as an aircrew sluggo, I’d be likely to deploy for a ‘Phoon Evac from Okinawa to points elsewhere, based on grease pencil smudges, etc. Ahem. Looking at the picture available at StormPulse (http://www.stormpulse.com/fullscreen/current) with the clouds switched on. . . The ‘potential tropical depression’ around 140 miles S of Jamaica – nothingburger there. Looking East. Two potentially interesting blobs, a bit southerly, but still, in the mid-Atlantic zone, 50/50 chance that one or the other will ‘pop’, even though they’re not ID’d as potentials yet. The rather sizeable wave discussed in the article is visible on the African West Coast, but appears rather un-energetic and disorganized. Looking at the circulation patterns over the US via the East CONUS IR Loop (http://www.goes.noaa.gov/GSSLOOPS/ecir.html) I don’t see enough organization of frontal/jetstream activity, other than a recurrent, semi stationary NE/SW afternoon T-storm line over the Southeast. 1 Named Storm. It shoots across the outer islands, skirts Cuba, enters the Gulf, smacks Mexico. I looked at some of the data from separate areas of the world, Japan, Turkey, and California / Nevada Back in the late 80’s and found there are signals in the synod conjunctions and solar / lunar syzygy that were consistent with the tidal effects being most significant when the moon was overhead with in 15 to 20 degrees, due to solid earth tidal bulge local effects, increased the possibility of stress changes that allowed or forced things to move, with good correlation of increased total number and quake strength. My son in law installed windows 2000 on a separate hard drive on my machine, in 2005, and with out thinking OK’ed the reformatting of ALL 4 hard drives to a Fat32 format…. When I get time I will reprocess the data (re-down loaded it now) and post it to my research pages, working on whole disk IR GOES 11-12 data base now for the creation of an animated movie, to show lunar declinational movement patterns. I have down loaded the daily ACE data, and am processing it onto spread sheets as I am waiting for ftp notice of fresh GOES data to download. Still trying to keep up with reading 8 to 10 blogs a day. Yes there is hope for quake forecasting, for increased risk and chance per periods of time when influence is strongest, I have not YET seen anything that would be able to forecast specific quake locations on specific dates. Then again I don’t have any data on residual strain for individual fault systems monitored on an hourly basis. Somehow this year’s seeming lack of a strong SW monsoon in West Africa inspires the WAG that relatively few easterly waves will develop into full-blown hurricanes. There are major pattern changes occurring over over the tropical and subtropical North Atlantic. That monster upper-level low over the Azores that has been spinning and shearing apart any chance of tropical cyclone development, has now been replaced with a large area of high pressure. This along with with unusually high Atlantic SSTs is the more traditional pattern of Atlantic TC development. One theory is that all of the intense bubbles of heat across the globe, pushed unusually large amounts of dry air into the upper levels of the atmosphere, which has inhibited development. Those “bubbles” of hot dry air, are rapidly breaking down. Watch as the upward motion machine takes over and the Cape Verde train sputters to a start. I hate to say it, because I live right on the vulnerable east coast, but hurricane season is just beginning. It will be a long season too….with these SST’s…..well into October, maybe even November. Delayed, but not denied. Ugh. A test of a theory. THEN, we should have the next 3 to 4 named storms spread out over the next 10 weeks. The season should finish in October. Your “theory” is just a guess at most, bud. That is alot of “ifs”….and the last two [the Iceland volcano and what “earth retaining global warming heat”] almost non sequtiurs…make your “then” even more implausible. There are more proven direct influences on tropical cyclone formation, such as abnormally high SST’s, large scale upward motion fields, and favorable atmospheric conditions. Better deal with them first. And 1913 was a negative AMO year, so that no doubt had a direct influence on the low tropical cyclone turnout that year. I fear this season. Something has got me very nervous about the next two months. One reason I check up on what’s up on WUWT is to see what experts think. However I also want to know what more ordinary folk think, for there is something to be said for old-fashioned intuition. It only takes one hurricane to remind people that such storms, though rare, can clobber Virginia. And Joe Bastardi does suggest the season may block the usual route out to sea, and encourage a so-called “short-cut storm” to head straight northwest into the US mainland. “I fear this season. Something has got me very nervous about the next two months. I think you would be right if the jets (or rather all the air circulation systems) were more poleward but as things stand the equatorward position is apparently blocking the free movement of energy required to release the energy in tropical latitudes in the form of explosive convective activity. The latitudinal position of the air circulation systems is not dictated solely by a single phenomenon such as the AMO. It is a balancing act between solar effects from above and the netted out global oceanic conditions from below at any given moment. At least that is my judgement from the oservational evidence and the current scenario is a good test of it. Someone is cooking the books at our nations capitals. Who could that be? Global warming alarmists in the Directorships? Who needs Al Gore’s protesters in the streets when our governments are saturated with “Chicken Littles” who are global warming alarmists? *Interesting that a Vice President and potential President of the United States, billionaire and Nobel Peace Prize Recipient is calling for an out pouring into the streets by global warming alarmists. How much damage did they do in Copenhagen and London last year trying to intimidate UN representatives at the big meeting in Copenhagen in December? Why? What is motivating Al to do that? More money? Needs to pay for his divorce? Massages? Cap and trade investments on the line? Anyway, if it were not for Al, I wouldn’t know as much as I do today. Ozone critical numbers have dropped in the last 3 years. Humidity is dropping in the upper atmosphere. Last year’s winter temperatures dropped to 1984 numbers. When the US winter temperatures drop below 33 degrees, last winter was around 31, it is very difficult to have the predicted number of storms projected by CSU, MET, NOAA and the Insurance research people. Hurricanes are a global warming even(. How can a global warming event increase while the cause is decreasing. See you at Thanksgiving. Turkey or Crow, Dude?.Small menu!. Stack your firewood a little higher and make the rows a little longer. We are just a day or so into the forecast period. There are no tropical depreassions even, anywhere to be seen, or expected. If the 130% is to be correct, I suggest there needs to be at least one hurricane occurring before the 30th August. Does anyone have an estimate of the latest date the first hurricane must start, if the 130% forecast is to be correct? Today’s Global vapor satellite animation shows both the domes in the North and South Atlantic still in place. The storm that came off the coast of Africa yesterday survived. It was steered down by the dome in the N. Atlantic to around 10D N. latitude. The cloud area is between satellites at the moment so I can’t tell if there is rotation for another four to eight hours, although the vapor image shows a tight circular presentation with some outflows to the South. If there is even the slightest hint of rotation I would not be surprised if the NHC calls this a TD in the next 24 hours. I believe they (NHC) too are waiting for better satellite coverage. If there are no changes, the domes should steer this disturbance due west until about 400 or so miles east of the Windward Islands. Hurricanes are a global warming event. Thanks for confessing that….although you and I would probably agree on the fact that listening to Al is not really a good thing….ever. They are normal heat release valves from the broiling tropics to the temperate latitudes. The latitudinal position of the air circulation systems is not dictated solely by a single phenomenon such as the AMO. Crap – in the previous Klotzbach thread I predicted an ACE of 130 for the year and the second named hurricane on August 20th. So much for the second prediction unless Invest 95 can spin up into a hurricane before midnight. The first prediction is looking better though! So what happened to all the ferocious hurricanes that the CAGW boffins were predicting in 2005 as they were shamelessly blaming Katrina and Rita on global warming? Why aren’t their feet held to the fire more often over that? Under my name prove that a Hurricane is a global warming event. In 1914, during a near zero year in sunspot activity, very cool sunspot cycles, there was severe winter temperatures that froze Niagara Falls in 1911. Thus, during the mini-ice age there probaly zero hurricanes. One is about ACE and the other is about when could the Earth have a hurricane. Hardly Nobel Peace Prize stuff, but plenty of charts. In 1914, there was one tropical storm during a near zero year in sunspot activity, very cool sunspot cycles, there was severe winter temperatures that froze Niagara Falls in 1911. Thus, during the mini-ice age there was probably zero hurricanes and of course zero ACE..
Now, we are in a solar sunspot minimum that will cool the Earth for the next 30 years. They will have to rewrite their science books in the very near future and start over in their understanding of hurricanes. I new Al was wrong. Just set out to prove it. Perhaps we should back of kicking Klotzbach and Gray, who at least had the decency to admit they were wrong. There problem lies in trying to predict events which have multiple drivers and to date climate science only has a sketchy knowledge about what is involved. The deterministic chaos inherent in all the climate factors which cause hurricanes to form means that there is always a low probability that forecasts will be correct. My view is that while the solar wind remains weak and the Saharan Air Layer (SAL) blows strong, dry and dusty we will get few storms, but come September/October, when solar wind increases, and the SAL loses strength I would expect to see some big storms. Regarding the hurricane ‘season’, it’s never over ’till the fat lady sings! August 18, 2010 at 1:58 pm – So, my prediction. As of at least noon, EST – Storm Pulse echoing 40% chance of formation @ approx 9N 24W. No other impulse waves evident over W. Africa. The afternoon firing T-storm front that was over the SE US 48 hours ago is now out overwater towards Bermuda, and dissipating, with nothing behind it to serve as a ‘ratchet’ to turn anything that develops to a N-Easterly path. Sticking with the original call. From 1996 to 2006 was our hottest hurricane seasons. They were the strongest and the meanest. The average winter temps for the US were the hottest in 110 years. It was also the end of some seven of the hottest sunspot cycles in 300 years. It appears there is an accumulated affect. If green house gases had an affect, it was a lid on a boiling pot. That slowly started changing with a near zero sunspot cycle beginning in 2007. We are now in a minimum. Don’t know were the bottom is, but 30 years cold winters are ahead. When I saw my first ACE charts two years ago come off of XLS, I got cold chills down my back and the shakes. A couple of things, Paul. I follow what you are driving at, especially in the whole CAGW scam. Where you lose me is that folks like Bastardi, and definitely Dr. Gray, are CAGW agnostics. Dr. Gray, whose hurricane forecasting abilities over the decades are legendary, has vehemently spoken out many times against all things Al Gore. That being said, he [and other hurricane experts] still stand by that this season should yield an intense Atlantic season. 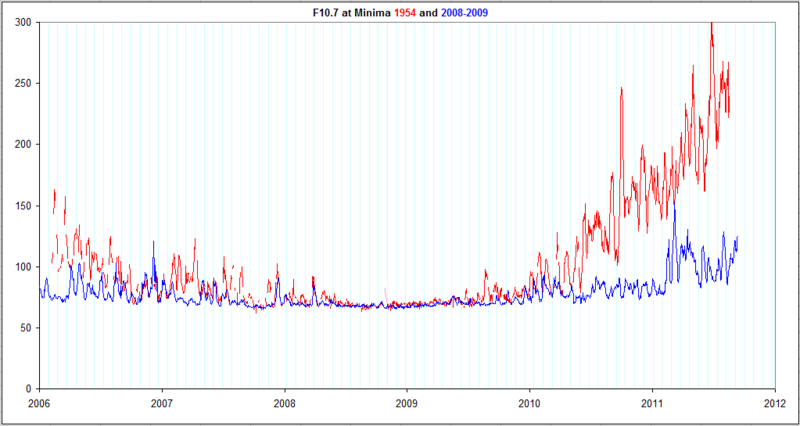 And if you are claiming a hidden ace in solar activity [not ACE lol], then at least in terms of F 10.7, there was a similar solar minimum to the one we are rebounding from, in about 1954. Granted, the F 10.7 is staying pretty low this time, as opposed to the rebound in 1954, but…. 1954 was also similar in two major oceanic cycles, with a negative PDO and a positive AMO. 1954 produced Carol, Edna, and one of the most intense and widespread hurricanes to ever impact the US…Hazel…in October of that year. In 1955, three hurricanes alone hit the North Carolina coast, Connie, Diane, and Ione. 1955 also produced one of the most violent ever recorded [at one time, 200 MPH winds], Janet, which devasted Belize that year. And you can’t really say that 1996 – 2006 were our “hottest and meanest” hurricanes, either. Also, hurricanes do not disappear during cold periods. There are some quite disastrous hurricanes that were recorded within the bounds of the Little Ice Age, including the deadliest Atlantic hurricane ever, in October, 1780. Indeed, the only category 4 hurricane to ever (on the modern historical record) to hit the Virginia coast where I live was in October, 1749. It completely reorganized the geography here, creating new inlets where there were none, and made a 3 mile long new sandbar….that is now home to thousands of houses and which shelters a bay that borders the largest Naval base on the planet. Those houses are definitely sitting ducks. I would never own there, that’s for sure. The point is is that there is just not much evidence that hurricanes diminish to nothing during cold periods. To the contrary, [and also to the contrary of the now debunked AGW myth of hurricanes being stronger when if the earth warms] we might have to batten down the hatches MORE during “cool” times. Nothing like that stark contrast between broiling tropical air and colder polar air masses and everything in between, to set in motion transfers of heat. We shall see what happens with this year…. I have started reading one of your papers, bro. I appreciate your zeal. But already what I have read, has been deductive, and not inductive. If you want to get more scientific attention, you should approach more inductively [with less assumptions]. Does Joe D’Aleo know that you are attributing all of this to him? I don’t think he takes quite as radical a view. Again, from one layperson to another, I appreciate your zeal. But, from one layperson to another, I would say that way more caution is needed. I will look forward to reading more of your paper and checking out the graphs. PS I see you are a retired Lt. Col. in the Army. Thanks for your service to the country. Please email me at sharkhearted@gmail if you would like to speak more. Correlation without mechanism, let alone cause, is what led us to worship soothsayers in caves. When they got out of bed, the Sun rose. I hit the submit button too soon. I am on a rant. Since this is just my personal opinion, it can be dismissed without causing me undo hurt feelings. I’m always put on incredulous alert when mechanisms are not part of proclamations that this or that will happen because the Moon is in the 7th house, Jupiter aligns with Mars and the Sun is snoozing. Bringing up graphs that match this or that and saying “Thus it is!” is a post not worth serious consideration. If you haven’t found a mechanism for your wriggle matching, then stop studying your graphs and start the serious search for the plausible mechanism. StormPulse now tracking and calling for 60% probability of development of disturbamce IVO 10N 31W. Cloud visuals appear to show coalescence, but no obvious organization. Pressure, at 1009MB is still a bit high. Review of East Conus IR loop indicates that blocking/ratcheting frontal boundary that was offshore yesterday has dissipated, and current circulation patterns favor shunting any W.African area origin storms onto a Southern/GOM track. Nice thing about being retired and not answering to anyone is freely writing an opinion and sometimes a rebuttal and being nice enough not to libel. Must give credit where credit is due. One stays out of trouble that way. I simply sat down and crunched numbers and found that the sunspot activity does affect our climate contrary to the IPCC and others. As I said, Al gore is the cause of my research. Not all researchers believe the mini-ice age ended in the late 1800s or mid 1700s. The cause ended in 1698 and I said 1700. See below comment from a thread going on in the same web site. That’s interesting, I mark the end of the LIA according to CET and other European records as being 1698. Too close to your figure to be a coincidence. So another point that we don’t all agree on. The cause probably ended in 1698 or 1700, but the affects lasted and are still showing the end of the mini-ice age, today. Glaciers are still melting and since no one was looking, maybe remelting from the 1970s ice age scare. Who knows? There was some progress in the Glacier Bay latitude. There was growth in 1968 and 2002. Reference, Joseph D’Aleo. He has my work. I was working the problem that he first discovered the answer to and that was the cyclic behavior of our sunspot cycles and minimums. I could not take credit he had earned first. But, I can quote him and interpret his work much as we are doing. You are right that there were major hurricanes in 1749 and 1780. On page 36 is the cycles since 1700 and their total mean for the respective cycles. There was sufficient sunspot activity to support these storms. Once the total mean climbs above 400 and during the peak periods of activity hurricanes become highly probable. With a year of 80 mean, there is enough heat for a hurricane season. I am redoing that page and your point is well taken. 1749 had very high mean for that year, 80.90. And a peak year for that cycle. You can go into SIDC, Belgium and verify that. 1780 was another year of 84.8 mean. It was preceded by 154.4 and 125.9 sunspot mean years. That creates what you need for a strong hurricane season. Official numbers for hurricane seasons starts in 1890. The 1954 to 1963 cycle was preceded by two “global warming” cycles. What I want to say is people stand up and take notice when it is very warm or very cold. They noticed the warming in that cycle. There were 92 named storms in the 1954 to 1963 cycle compared to 110 and 103 of the previous cycle. 1996 to 2007 sunspot cycle had 172 named storms and 1/4th were major hurricanes. 1954 to 1963 cycle had 31 major hurricanes. I list the basics for a hurricane and one is ocean temperatures. 82 degrees and 100 feet deep. Also, an area to mass, precipitation, and if you go back into the good Doctor K’s work he could give us a list of things. I have a couple of his papers from previous decades. My main point in my work is to get people off of man-made global warming and look at the rest of the factors. I hope this answers some of your questions. Most of this past centuries charts are in the two papers. Have fun with them. Man-made global warming at this point, for all of us, is a non-issue. More correctly, man-made pollution is a real and vexxing problem to our species. Its crazy, because these completely two separate arguments, have been treated as one. A fatal, doomed flaw in the AGW myth. There are many, MANY other more direct variables which contribute to hurricane formation here on Earth [in its closed system], that should be answered first. Take up golf and/or fishing. It goes back to the first of the week and why I think there are about four more named storms left in the season. 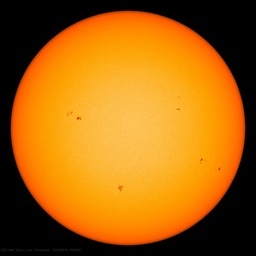 The Earth is cooling down due to the lack of sunspot activity. Show the mechanism first. I appreciate your intrepid approach here, but you gotta produce a mechanism. One good established mechanism is that the Earth is cooling due to the ENSO cycle. Perhaps the sun is modulating all this from afar, and in lag, but you must account first for the most direct driver of Earth’s climate–the oceans. And you can not deduce that when the planet “cools”, the energy that is required to form tropical cyclones, goes away. To the contrary, [and to the contrary of what the warmists were saying] it may be just not be true. Stuck like a German tank in Russian mud. If you burn down your house, don’t blame me. Step into your kitchen. Put a pot of water on the stove. Put the oven up to 500 degrees. Open or close the oven door. Turn on the burner under the pot to 1/4th. This is your sunspot activity. Turn it up half. This is a cool/warm sunspot cycle. This is about 400 total mean for a cycle. Turn it up to 3/4s. This is a cycle at 600 to 700 total mean for a cycle. Now, raise it up to high and this is 900 plus sunspot cycle mean. Now turn down the heat to 3/4s.that small moment where boiling out of control to calm is 2003 to 2006. 2006 was 26 tropical storms and two major hurricanes. Now turn it down to half; 2007 to 2009. Now turn it to 1/4 th. 2010. Did you notice the humidity drop off from the pot and the dry oven heat taking over. Direct flare heat from sunspots and humidity. As I said to the good CSU and earlier in this blog, the missing formula for hurricane seasons (not El Ninos or La Ninas) is humidity. There is very little now. Remember 4 to 7 named storms of 50/50 mix of tropical storms and hurricanes and several tropical depressions. I think CSU and HTC were at 22 named storms and about 10 were major hurricanes. Lots of luck and not a prayer. That was my point and I stand by it. In which numbered entry did you state you point? I would not give them full credit yet. They predicted 22 storms and 10 were to be CAT 3 or higher. This is a down sized forecast from several months ago. Right now they are at 6 named storms, 50/50 mix TROPICAL STORMS AND HURRICANES, two made CAT 3+. So far only Caribbean or Gulf of Mexico storms have reached mainland Mexico of US. They have 2/3s to go and have 8 weeks to do it in. They need 16 more named storms and 8 have to be major hurricanes. Tomorrow is 1 Sept. Peak day. The subject of this post was their forecast for the period Aug. 18 – Aug. 31: “the next two weeks should be active.” That is what they nailed and that is what I give them full credit for. Being a Floridian, we have a growing attitude to blow off CSU. We tend not to take their forecast seriously.